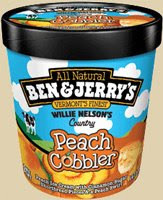 [Retired end of 2013] Wow, another flavor from Ben & Jerry's that doesn't mess around. It only took one bite of this ice cream to know it meant business. It's not content with just being a "snack", no no, it wants to be the main dessert on your table and take orders from no one. While the Breyers Peach goes the smooth and mellow route, the fresh peach taste is front and center here, and I hope you like cinnamon, because it's hard to miss. On Second Scoop: I was thinking about my review and realized I needed to sneak a few more bites. I was really shocked when I barely even noticed the cinnamon this time around, but I think it's because I was aiming for the shortbread pieces rather than the peach swirl. I still think it's much bolder than the Breyers, but I guess that's why you should judge a flavor on more than a couple bites.